Der Artikel Francesco Cavalli (1602-1676): Gli amori d'Apollo e di Dafne wurde in den Warenkorb gelegt. A chorister at St Mark's in Venice under Monteverdi, Cavalli became organist at the Basilica in 1639 and was to win a reputation as a leading composer of opera for the new commercial opera-houses of Venice in the generation after Monteverdi. 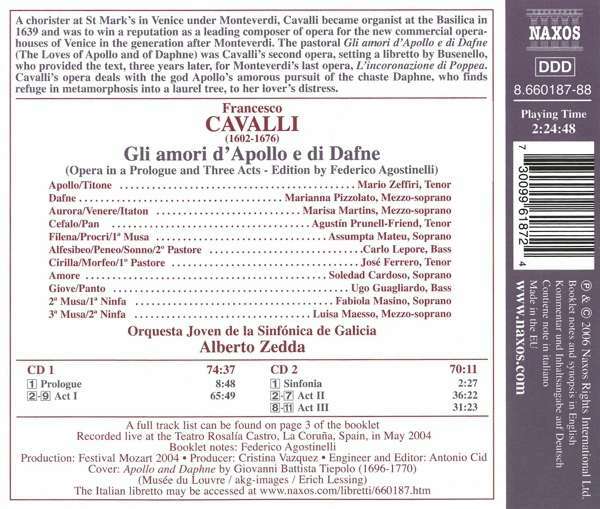 The pastoral Gli amori d'Apollo e di Dafne (The Loves of Apollo and of Daphne) was Cavalli's second opera, setting a libretto by Busenello, who provided the text, three years later, for Monteverdi's last opera, L'incoronazione di Poppea. Cavalli's opera deals with the god Apollo's amorous pursuit of the chaste Daphne, who finds refuge in metamorphosis into a laurel tree, to her lover's distress.